I absolutely loved the design but upon opening the curtain, I first noticed the stitching at the very top was really uneven. I figured it wasn't all that bad so I decided to place them on my curtain rod, I immediately saw white streaks in the middle of the curtain. I was planning on keeping them, but then noticed another defect on the second curtain that I also purchased. It had some sort of burnt stain/mark. I could't quite pin point what it was. These curtains are beautiful but based on my experience, it feels and looks poorly made (unless I just ended up with a bad batch). 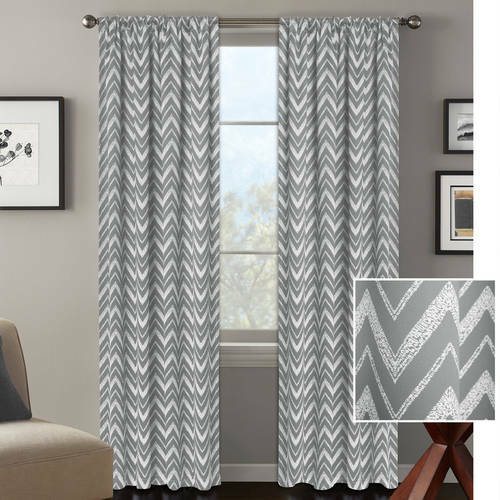 Home territory searches the web to find the best prices and availability on Curtain Panels and related products foir your home like Better Homes and Gardens Textured Chevron Room Darkening Curtain Panel. For this page, related items include products we find that match the following keywords: "Curtain Panel" at our vendor partner Walmart - Click More Info / Buy Now to check for price rollbacks!. Better Homes and Gardens Textured Chevron Room Darkening Curtain Panel is one of 123 Curtain Panels and related products available for sale through HomeTerritory.com, If you have any questions on this product, please give us a call at 734-971-1210 during the hours of 9am - 5pm EST for assistance. Thank you for shopping at Home Territory, the home furnishings superstore!